The Sonic Screwdriver is a staple to the Doctor Who series, just like how phasers are to the Star Trek world, while lightsabers happen to flood the Star Wars galaxy. Having said that, Doctor Who fans would be thrilled to find the £79.95 Twelfth Doctor’s Sonic Screwdriver Universal Remote looking just like a Time Lord’s apparatus, and the next best thing to being able to travel through time would be the ability to control the way your appliances work from afar without having to so much walk over – all that it takes is a single button press, and that’s that. The Twelfth Doctor’s Sonic Screwdriver Universal Remote, as its name suggests, is a fully-functioning universal remote that will be able to control the likes of your TV, DVD or Blu-Ray player and other gadgets with multiple gestures. This is a 1:1 scale replica, and is one of the more realistic recreations of the Sonic Screwdriver that was used by Peter Capaldi in Series 8. 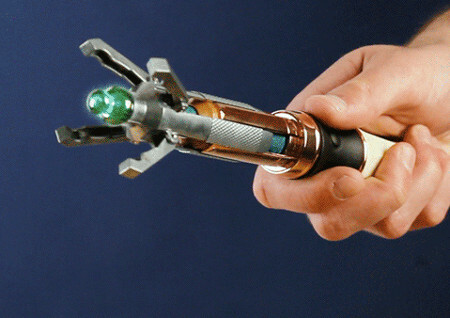 Do take note, however, that the Twelfth Doctor’s Sonic Screwdriver Universal Remote does not have the ability to pick locks, to control the properties of atoms and molecules, to keep track of alien life or provide geolocation, intercept and conduct teleportation, as well as control computers. The green, light-up tip and a dozen authentic Sonic sounds makes it all the more realistic, as it runs off a pair of AAA batteries.